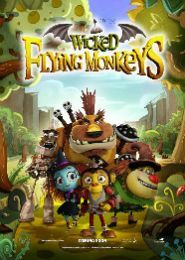 Wicked Flying Monkeys 3D (aka Save OZ!) by Alberto Mar . :FILM SHARKS :. Ozzy is an enthusiastic and friendly flying monkey, son of the legendary Goliath, the brave warrior. They serve Evilene - the wicked witch - just as the rest of their kin. But Ozzy is not happy about it and when Evilene's plans put Oz once again in peril, Ozzy reaches out to the 'Champions of Oz' the Lion, the Scarecrow and the Tinman, three great friends with incredible qualities that have taken Emerald City to its maximum splendor. Unfortunately, this will not be easy, they have not been themselves lately, and this is putting it mildly, they have gone bananas as of late (flying monkey pun intended), thanks to Evilene of course. On top of that a very angry army of flying monkeys is bent on capturing Ozzy and making sure the Champions are no more.